Thoracoabdominal aortic aneurysms (TAAAs) are permanent localized dilations of the aorta that involve the celiac axis and extend proximally or distally from this point. The development and use of multimodal protective adjuncts in specialized surgical centers over the last 20 years have greatly decreased the risks traditionally associated with open thoracoabdominal aortic repair, namely, death, paraplegia, and renal failure. Nonetheless, managing patients during and after TAAA operations remains challenging, as postoperative complications may develop because of the inherent complexity of these repairs and the usual array of comorbidities. 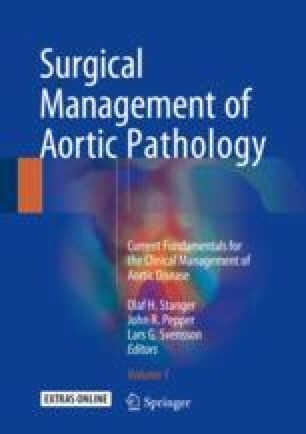 Here, we provide the nuanced details of performing open thoracoabdominal aortic repair accompanied by a comprehensive pictorial atlas. In the near future, aortic specialists will face increased demand for services as our population ages and as diagnostic capabilities improve to better identify TAAA—at the same time, fewer physicians are specializing in open aortic repair. Today, the skills to perform open TAAA repair remain in demand as there are only a handful of centers with sufficient expertise to perform such repair. We thank Stephen N. Palmer, PhD, ELS and Susan Y. Green, MPH for contributing to the editing of the manuscript. Figures were used with permission from Baylor College of Medicine.